When two great chefs—buddies and business partners for twenty-odd years—decide to write a cookbook about the simple Italian food they love, you get decades of experience, sage advice, and wonderful recipes. And you also get a few great arguments thrown in along the way, as Pino and Mark debate the right way to make everything from meatballs to pot roast to eggplant parmigiana. Of course, the issue is not whose recipes are better—Pino and Mark would be first to praise each other's food. And it's not about a right or wrong way. It's about preferences in ingredients, technique, and approach. Pino, a native of Tuscany cooking in America, is a purist. His food is grounded in tradition. Mark, a New Yorker, loves the Italian-American cooking he grew up with. Each has his favorite recipes (see back cover) and his own way, but they're bonded by a shared philosophy that the simplest food is the best, and a shared desire to please families, friends, and loyal customers with food that makes them happy. ...the end result is the same—unpretentious food that is timelessly pleasing. This is home cooking at its very best. Pino Luongo came to America from Italy in 1980 with three passions: the Italian zest for life, his love of acting, and a passion for cooking. He is an acclaimed New York chef and restaurateur, whose restaurants includ Centolire, Coco Pazzo, and Tuscan Square. 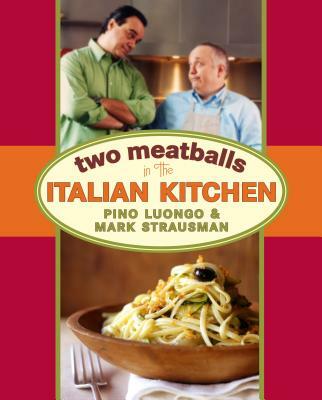 Two Meatballs is Luongo's fifth cookbook, preceded by A Tuscan in the Kitchen, Simply Tuscan, Fish Talking, and La Mia Cucina Toscana. Luongo lives with his wife and children in Westchester, where he coaches his son's soccer team, listens to Italian pop songs and opera, and cooks. Mark Strausman, a Queens native, began his career in food service selling peanuts at Shea Stadium. He is the co-owner, with Pino Luongo, of Coco Pazzo in Manhattan, where he is chef. He is also the executive chef/managing director of Fred’s at Barney's in Manhattan. and the author of author of The Campagna Table. Mark and his two sons live in New York City. In this delightful book, Luongo and Strausman, friends and restaurateurs in Manhattan, put a personal spin on the divide between cuisine from Italy and the American variety. Each chapter opens with lengthy back-and-forths between the two over the merits of certain ingredients or cooking methods, and their disagreements over these specifics is as edifying as it is amusing to read; the recipes aren‚Äôt all simple, but with Luongo and Strausman‚Äôs vocal observations and tips close at hand, those familiar with Italian cooking techniques should have no trouble mastering them. Luongo‚Äôs loyalties to his native Tuscany show in recipes such as Garfagnana Bean and Apple Soup and Sausage and Cranberry Beans with Polenta, though he also refers to many of Italy‚Äôs other regions in his focus on authenticity. Strausman defends his Americanized vision of Italian food with dishes both old-fashioned (Chicken Parmigiana) and chicly modern in flavor (Carrot and Ricotta Ravioli). The indispensable chapter of meatballs and meatloaf crystallizes their disagreements, as Luongo defends small, flavor-packed meatballs with unusual ingredients like amaretto cookies, mostly served on their own, and Strausman advocates the plump kind Americans serve atop spaghetti and tomato sauce. Cooks interested in the distinctions between regional Italian specialties yet still fond of the American versions they grew up with will savor almost every recipe in this spirited book.